We examine global atmospheric transport that impacts chemistry and climate. In particular, we compare exchanges of troposphere and stratosphere air from large-scale processes as depicted from multiple modern reanalysis models (those intending to provide "best guesses" of the global atmospheric state at a given point in time). We find that transport varies considerably amongst the reanalyses and is sensitive to the choice of troposphere–stratosphere boundary. How can mountaintop CO2 observations be used to constrain regional carbon fluxes? Mountainous areas can potentially serve as regions where the key greenhouse gas, carbon dioxide (CO2), can be absorbed from the atmosphere by vegetation, through photosynthesis. Variations in atmospheric CO2 can be used to understand the amount of biospheric fluxes in general. However, CO2 measured in mountains can be difficult to interpret due to the impact from complex atmospheric flows. We show how mountaintop CO2 data can be interpreted by carrying out a series of atmospheric simulations. The response of aerosol particles to changes in relative humidity (RH) is dependent on the hygroscopicity of the constituent chemical components. We present accurate measurements of the hygroscopic response of aerosols over a wide range in RH, extending up to the saturation RH. The chemical compounds studied include dicarboxylic acids, amino acids, sugars and polyols. These data provide a comprehensive source of data to help improve functional group activity models of aerosol hygroscopicity. The importance of mineral dust for cloud droplet formation is studied by considering the adsorption activation of insoluble dust particles and the thermodynamic interactions between mineral cations and inorganic anions. This study demonstrates that a comprehensive treatment of the CCN activity of mineral dust and its chemical and thermodynamic interactions with inorganic species by chemistry climate models is important to realistically account for aerosol–chemistry–cloud–climate interaction. The aerosol effects on warm cloud parameters over the Yangtze River Delta are systematically examined using multi-sensor retrievals. This study shows that the COT–CDR and CWP–CDR relationships are not unique, but are affected by atmospheric aerosol loading. CDR and cloud fraction show different behaviours for low and high AOD. Aerosol–cloud interaction (ACI) is stronger for clouds mixed with smoke aerosol than for clouds mixed with dust. Meteorological conditions play an important role in ACI. We quantify contributions of 13 source sectors to air pollution in Europe using a model (CAMx) with source tracking. This information is needed to develop clean air strategies that will be effective. Contributions differ between summer and winter. Sources outside western Europe and natural sources (vegetation) are important in summer. Important sources within Europe are transportation, energy production, industry, and, in winter, residential wood combustion. The inverse modelling approach for estimating surface fluxes is based on transport models that have an imperfect representation of atmospheric processes like vertical mixing. In this paper, we show how assimilating commercial aircraft-based vertical profiles of CO2 into inverse models can help reduce error due to the transport model, thus providing more accurate estimates of surface fluxes. Further, the reduction in flux uncertainty due to aircraft profiles from the IAGOS project is quantified. This work quantifies the contribution of the seasonal changes in ozone and water vapour to the temperature cycle in a region of the atmosphere about ~ 18 km up in the tropics (the lower stratosphere). This region is important because most of the air entering the stratosphere does so through this region and temperature fluctuations there influence how much water vapour enters the stratosphere and hence the properties of the stratosphere. Fine particle pH is linked to many environmental impacts by affecting particle concentration and composition. Predicted Pasadena, CA (CalNex campaign), PM1 pH is 1.9 and PM2.5 pH 2.7, the latter higher due to sea salts. The model predicted gas–particle partitionings of HNO3–NO3−, NH3–NH4+, and HCl–Cl− are in good agreement, verifying the model predictions. A summary of contrasting locations in the US and eastern Mediterranean shows fine particles are generally highly acidic, with pH below 3. In support of the HTAP phase 2 experiment, we conducted a number of regional-scale Sulfur Transport and dEposition Model base and sensitivity simulations over North America during May–June 2010. The STEM chemical boundary conditions were downscaled from three (GEOS-Chem, RAQMS, and ECMWF C-IFS) global chemical transport models' simulations. Analyses were performed on large spatial–temporal scales relative to HTAP1 and also on subcontinental and event scales including the use of satellite data. Methane is an important greenhouse gas and increasing atmospheric concentrations result in global warming. We present a simple method to derive annual methane emission estimates of methane hotspot areas from satellite data. We present results for four source areas. We found that our estimates are in good agreement with other studies/data sets for the Four Corners region in the USA and for Azerbaijan but we also found higher emissions for parts of California and Turkmenistan. Rapid climate changes within the Arctic have highlighted existing uncertainties in the transport of contaminants to Arctic snow. Fresh snow samples collected frequently through the winter season were analyzed for major constituents creating a unique record of Arctic snow. Comparison with simultaneous atmospheric measurements provides insight into the driving processes in the transfer of contaminants from air to snow. The relative importance of deposition mechanisms over the season is proposed. Using novel methods of cloud detection from aircraft data over the Sahara desert, we evaluate the performance of the Meteosat satellite in measuring cloud properties: namely, the cloud mask and the cloud-top height. We find that the cloud mask can justifiably be used for many applications (such as creating a detailed Saharan cloud climatology), and we also discuss its limitations. As for the cloud-top height, we show that the dataset cannot yet be considered robust in this part of the world. The paper presents the second version of a global climate data record based on satellite measurements from polar orbiting weather satellites. It describes the global evolution of cloudiness, surface albedo and surface radiation during the time period 1982–2015. The main improvements of algorithms are described together with some validation results. In addition, some early analysis is presented of some particularly interesting climate features (Arctic albedo and cloudiness + global cloudiness). We present ground-based tropospheric NO2 measurements performed within the area of Thessaloniki, Greece. The comparisons with OMI/Aura, GOME-2A and GOME-2B data sets have shown a significant underestimation of the NO2 levels over the urban area by the satellite sensors. This finding can be attributed to the strong NO2 gradients. By applying adjustment factors, calculated using an air quality model, on the OMI/Aura observations, the comparison over the urban site has improved significantly. We have deployed a single particle soot photometer (SP2) to characterize black carbon (BC) aerosols near industrial sources in Japan in the early summer of 2014 and at a remote island in the spring of 2015. The observed changes in the SP2-derived size distributions and mixing state of BC-containing particles with air mass transport are connected to meteorological variability (transport pathways and air mass histories) in spring in east Asia. How does sea ice influence δ18O of Arctic precipitation? The recent decades loss of Arctic sea ice provide an interesting opportunity to study the impact of sea ice changes on the isotopic composition of Arctic precipitation. Using a climate model that can simulate water isotopes, we find that reduced sea ice extent yields more enriched isotope values while increased sea ice extent yields more depleted isotope values. Results also show that the spatial distribution of the sea ice extent are important. New complete cloud parameterizations of cloud droplet effective radius and the two-moment cloud-to-rain autoconversion process explicitly accounting for dispersion are implemented into CAM5.1. The results show that the consideration of dispersion effect can significantly reduce the changes induced by anthropogenic aerosols in the cloud-top effective radius and the liquid water path, which reduces the AIF substantially at a global scale, especially in the Northern Hemisphere. We provide a 3D multiyear analysis on the evolution of Saharan dust over Europe, using a dust product retrieved from the CALIPSO satellite and using EARLINET methods. The results reveal for the first time the 9-year 3D seasonal patterns of dust over its transport paths from the Sahara towards the Mediterranean. The dataset is unique with respect to its potential applications, including the evaluation of dust models and the estimation of ice nuclei concentration profiles from space. Strong events of biomass burning aerosol transported from North American forest fires were detected during July 2013 at three European stations from EARLINET. Satellite observations and models were used to estimate the smoke sources and transport paths. Using lidar techniques and regularization algorithms, the aerosol layers were optically and microphysically characterized, finding some common features among the events, concerning the similar aging processes undergone by the particles. Understanding observed storm microphysics via computer simulation requires measurements of aerosol on which most hydrometeors form. We prepare aerosol input data for six storms observed over Oklahoma. We demonstrate their use in simulations of a case with widespread ice outflow well sampled by aircraft. Simulations predict too few ice crystals that are too large. We speculate that microphysics found in tropical storms occurred here, likely associated with poorly understood ice multiplication. Detailed and accurate vertical distributions of cloud properties are essential to accurately calculate the surface radiative flux and to depict the mean climate state, and such information is more desirable in the Arctic due to its recent rapid changes and the challenging observation conditions. This study presents a feasible way to provide such information by blending cloud observations from surface and space-based instruments with the understanding of their respective strength and limitations. One of the issues that hinder the measurement-based assessment of aerosol–cloud interactions by remote sensing methods is that typically aerosols and clouds cannot be measured simultaneously by passive remote sensing methods. AERONET includes the SDA product that provides the fine-mode AOD also in mixed cloud–aerosol observations. These measurements have not yet been fully exploited in studies of aerosol–cloud interactions. We applied SDA for this kind of analysis. This study investigates possibilities for improving the representation of black carbon (BC) distribution in a global atmospheric chemistry-transport model by exploring uncertainties in key processes controlling the removal of aerosols from the atmosphere. Our results provide an increased understanding of the processes contributing to uncertainties in the BC abundance and climate impact and underline the importance of more observations and experimental data further constrain models. We collected Saharan dust at the Mauritanian coast as well as in the deep the North Atlantic Ocean, along a transect at 12 °N, using an array of moored sediment traps. We demonstrated that the lithogenic particles collected in the ocean are from the same source as dust collected on the African coast. With increasing distance from the source, lithogenic elements associated with clay minerals become more important relative to quartz which is settling out faster. Seasonality is prominent, but weak. We compare absorption aerosol optical depth (AAOD) and single scattering albedo (SSA) from AERONET retrievals with AAOD and SSA obtained from in situ vertical profiling flights over two rural sites in North America. The direct comparisons of in situ derived to AERONET-retrieved AAOD (or SSA) reveal that AERONET retrievals yield higher aerosol absorption than obtained from the in situ profiles. This has implications for models using AERONET to evaluate or scale their simulated absorption values. While it is widely recognized that air pollutants adversely affect human health and climate change, their impacts on the regional carbon balance are less well understood. 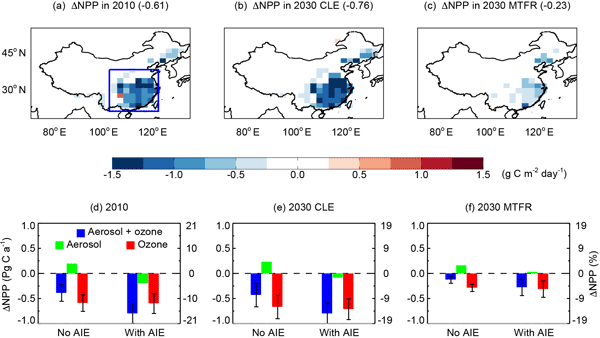 We apply an Earth system model to quantify the combined effects of ozone and aerosol particles on net primary production in China. Ozone vegetation damage dominates over the aerosol effects, leading to a substantial net suppression of land carbon uptake in the present and future worlds. We present upper-tropospheric trace gas measurements in the Asian summer monsoon anticyclone, obtained with the HALO research aircraft in September 2012. The anticyclone is one of the largest atmospheric features on Earth, but many aspects of it are not well understood. With the help of model simulations we find that entrainments from the tropopause region and the lower troposphere, combined with photochemistry and dynamical instabilities, can explain the observations. This study reports new aircraft field observations of elevated water vapor greater than 10 ppmv in the overworld stratosphere over the summertime continental US. Back trajectories from the flight track intersect overshooting convective tops within the previous 1 to 7 days, suggesting that ice is convectively and irreversibly transported to the stratosphere in the most energetic overshooting convective events. Satellite measurements (Aura MLS) indicate that such events are uncommon (< 1 %).